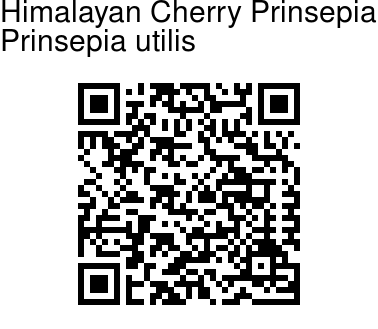 Himalayan Cherry Prinsepia is a spiny shrub, growing up to 1–5 m tall. Branches are grayish green, robust, branchlets green to grayish green, angled, brown velvety to hairless. Spines are up to 3.5 cm long. Winter buds are purplish red, ovoid to oblong, hairless. Leaf stalks are about 5 mm long. Leaf blade is oblong to ovate-lanceshaped, 3.5–9 cm long, 1.5–3 cm wide, base broadly wedge-shaped to rounded, margin toothed, tip pointed to long pointed. Flowers are borne in racemes in leaf axils, or on short branchlets, 3–6 cm, many-flowered. Flowers are 1 cm in diameter. Flower- stalks are 4–8 mm, up to 1 cm in fruit. 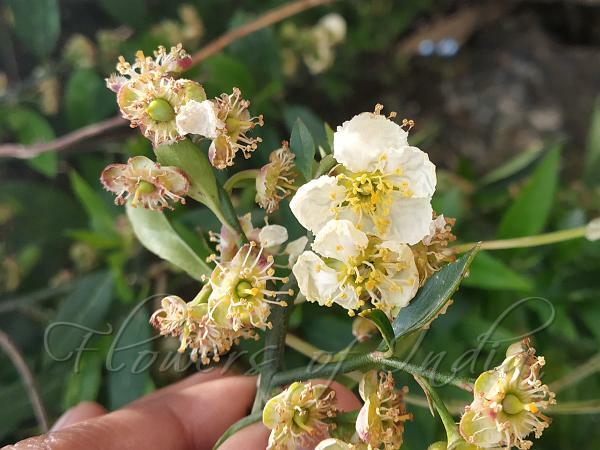 Flower base is cup-shaped, outside brown velvety. Sepals are semicircular to broadly ovate, outside brown velvety when young and densely so on margin. Petals are white, broadly obovate, base shortly clawed, margin apically erose. Stamens are in 2 or 3 whorls. Fruit is purplish brown to blackish purple, oblong to obovoid- oblong, about 8 mm in diameter. Flowering: April-May.